A City Inscribed and Asian Studies Lunar New Year event. Registration is strongly encouraged. Hong Kong is internationally renowned for its density, often depicted by images of the dramatic skyline of Hong Kong Island with Victoria Harbor in the foreground and the Peak behind. However, for those who are more familiar with the city, another image is likely more representative: that of the city’s animated, almost visually cacophonous, narrow streets and ubiquitous stairs. 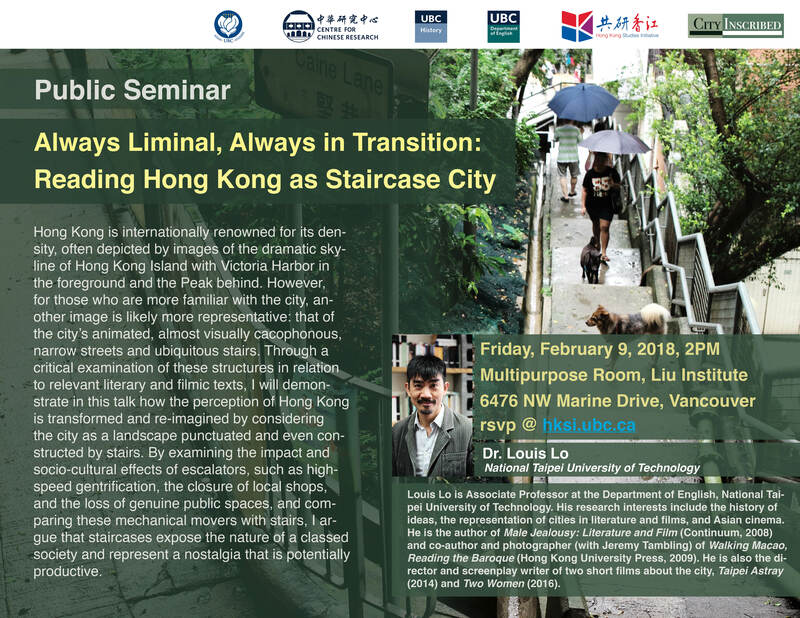 Through a critical examination of these structures in relation to relevant literary and filmic texts, I will demonstrate in this talk how the perception of Hong Kong is transformed and re-imagined by considering the city as a landscape punctuated and even constructed by stairs. By examining the impact and socio-cultural effects of escalators, such as high-speed gentrification, the closure of local shops, and the loss of genuine public spaces, and comparing these mechanical movers with stairs, I argue that staircases expose the nature of a classed society and represent a nostalgia that is potentially productive. Louis Lo is an associate professor in the Department of English at the National Taipei University of Technology. His research interests include the history of ideas, the representation of cities in literature and films, and Asian cinema. He is the author of Male Jealousy: Literature and Film (Continuum, 2008), and co-author and photographer (with Jeremy Tambling) of Walking Macao, Reading the Baroque (Hong Kong University Press, 2009). He is also the director and screenplay writer of two short films about the city, Taipei Astray (2014) and Two Women (2016). This seminar is organized by the Hong Kong Studies Initiative and co-sponsored by the Department of Asian Studies, the Centre for Chinese Research, the Department of History, and the Department of English. Online registration is now closed. To find out if it is still possible to attend, please email us at hksi.ubc@ubc.ca.